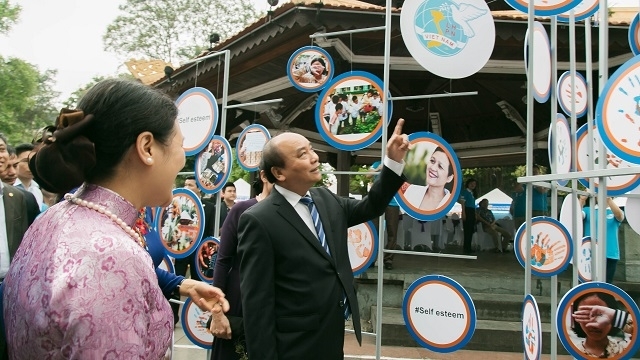 The UN Women in Vietnam, the Vietnam Women’s Union (VWU), and the Vietnamese Women’s Museum launched a mobile exhibition themed “The safe journey” on March 6 to raise public awareness of ensuring safety for women and children. The exhibition is part of the VWU’s activities in 2019 themed “Safety for women and children”, and in response to the upcoming International Women’s Day (March 8). UN Women Chief Representative in Vietnam Eliza Fernandez said that gender-based discrimination and violence against women and children, especially girls, is the most frequent type of human rights violation, but also one of the crimes least prosecuted. Therefore, through the exhibition, UN Women encourages all to join hands to ensure safety for all women and girls so they can bring into full play their confidence, vigor and potential, she added. The mobile exhibition vehicles are being sent to public spaces such as Hoan Kiem Lake, as well as parks, schools, and the headquarters of women’s unions across several wards in Hanoi. Within the framework of the event, the Vietnamese Women’s Museum has also organised multiple interaction activities – such as a photo-taking set up featuring boards with the exhibition’s message and story sharing activities via writing or drawing – with the goal to call on the public to work together to build a safer city for women and children. The exhibition will last until March 31. After that, works in the exhibition will be placed at the Vietnamese Women’s Museum.